People LOVE a good crock-pot meal, but I have a confession to make. I'm not really a fan. Usually the flavor is great, but the texture is not my cup of tea. That's why when I try a recipe that I love, I MUST share it with you. 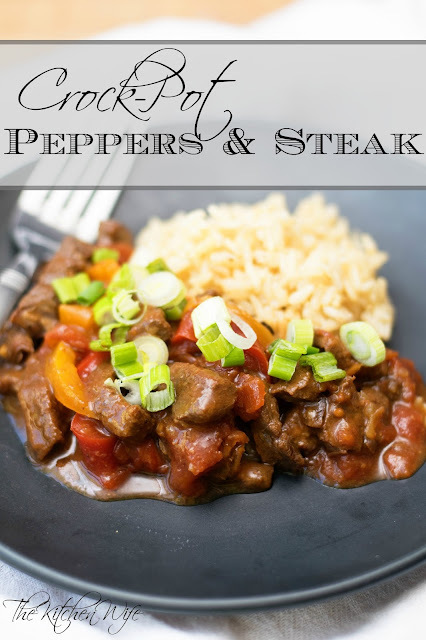 This Crock-Pot Peppers and Steak Recipe is a new family favorite of ours. So to begin I want to share a little trick with you. When slicing your meat, if you put it in the freezer 30 minutes before you cut, it will slice so much easier. Trim any fat from the meat and thinly slice. Place the meat in a resealable bag and add the cornstarch and garlic powder with some salt and pepper. Seal the bag and shake until all the meat is coated. Next pour in the soy sauce. Reseal the bag and rub the marinade all over the steak and let sit in the refrigerator for 30 minutes to overnight. Now to your crock-pot add the bell peppers and onion. I was out of onion so I used minced onion here. It's like Julia Child says, there is nothing that can't be fixed in the kitchen. Now mix the rice wine vinegar and cornstarch together to make your slurry. Pour the slurry into the crock-pot. Now add the marinated meat to the crock-pot and stir it all in. Place the lid on crock-pot and turn it on LOW for 8-10 hours or HIGH for 4-8 Hours. After the recommended cooking time taste for seasoning and add any salt and pepper you may feel it needs. Place the steak in a resealable bag and add salt, pepper, garlic powder, and cornstarch. Open the bag and pour in the soy sauce. Seal the bag and let steak marinate for 30 minutes to overnight. 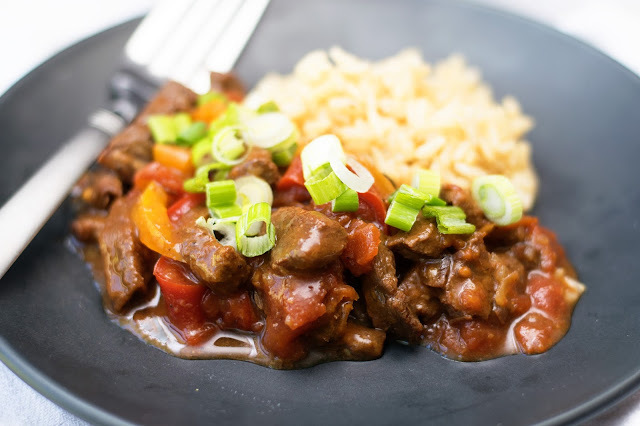 In the crock-pot add the bell peppers and onions, the can of tomatoes, brown sugar, Worcestershire sauce, water, garlic powder, and ground ginger. Make a slurry by mixing together the rice wine vinegar and cornstarch. Pour into the crock-pot. Cover and cook on LOW for 8-10 hours or HIGH for 4-8 hours. Serve over rice and top with green onions and sesame seeds. This looks colorful, easy, and delicious. Will make this for my hubby. He actually has some deer tenderloin strips left from fall we need to use. I bet he would love it in this. Thanks for another wonderful recipe.